We’re eager to welcome you to our charming Sun Valley inn. General Manager Timothy Mott, a lifelong resident of Sun Valley, joined the Knob Hill Inn team in 2013. Having grown up in the hotel industry, his mother a manager of the Sun Valley Resort for 20 years, Timothy brings a diverse understanding of hotel operations. Timothy, twice named Hawaii Sportswriter of the Year, is a third generation, diehard Chicago Cubs fan, and avid sportsman, who enjoys skiing fast, playing golf, and fishing and camping with his family. He is the proud father of two active sons, ages 12 and 16, and has an amazing wife Riley, whose famous Austrian grandfather has a ski run named after him on Bald Mountain (Sigi’s Bowl). His local roots run deep. 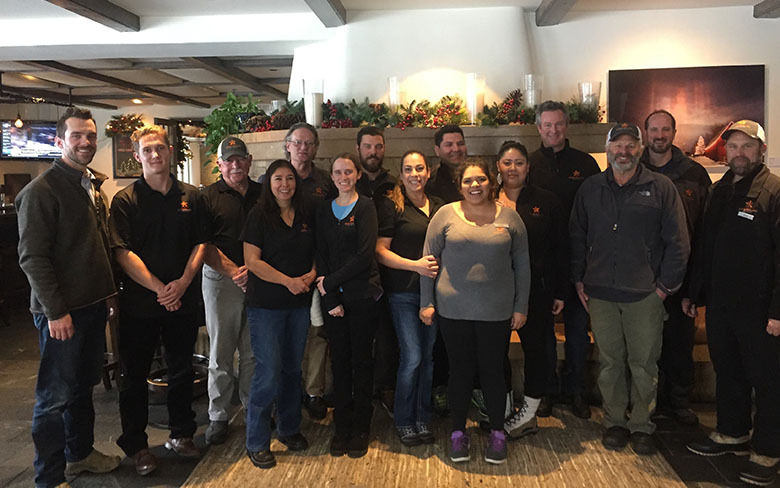 “Watching our team interact with our guests to create amazing guest experiences, and seeing our guests walk out the front door of the hotel knowing that our Knob Hill team made their stay memorable,” is how he describes his favorite part of leading the team at our charming Sun Valley inn. Assistant Manager Jennifer Schade joined the Knob Hill Inn team in early 2017. The speed with which she made herself indispensable left no one surprised that hospitality is in Jennifer’s blood. Her grandfather was a founder of Choice Hotels International and she grew up working in her family’s hotel in Sequim, WA. Before coming to our Sun Valley hotel, Jennifer held a variety of positions at the Sheraton Grand in Sacramento, CA and the Sheraton Resort in Steamboat Springs, CO. Jennifer is the proud mother of a dog named Violet and enjoys exploring the miles of hiking that Sun Valley has to offer. Bob Dunn, co-owner of The Grill at Knob Hill, has been a member of the Sun Valley community for over 30 years and is going on seven years at The Grill. When he’s not at work you can find him on the golf course or hitting the slopes. Bob most looks forward to meeting new guests and enjoys catering to their loyal following of local customers. Executive Chef Sarah Janego has a robust background in the culinary arts, having worked at several restaurants and as a private chef. In the two years she’s been at The Grill at Knob Hill she has found a love for weekend camping trips with her husband and dog in the summer and snowboarding fresh powder in the winter. Sarah loves the freedom to serve guests at The Grill creative menu items and focuses on the changing of the season in her cooking.